This is the cheapest treadmill desk workstation that I could find! It is composed of the best portable treadmill, a confidence treadmill, a used drafting table, some bricks to elevate the drafting table more and duct tape to stabilize the legs of the drafting table. Price: $199.99 + a used drafting table from a yardsale and some bricks! Price is a big feature for this workstation. Most people will want to spend a bit more money for less wobbling and a higher quality treadmill. 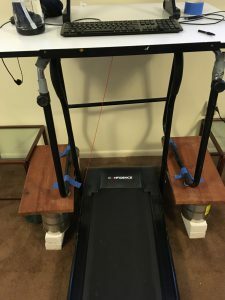 However, if you aren’t sure about walking and working just yet, this DIY model is a great way to gain some experience with a treadmill desk before investing upwards of $1,000 on your treadmill desk workstation. The Confidence Treadmill that accompanies this treadmill desk workstation received 4 star reviews on Amazon. It is lightweight and easy to move. It can be folded up easily and stored under a bed or in a closet when not in use. Most of the reviews mentioned that at a price tag of under $200, it is a big bang for your buck. However, there were a few that pointed out it is more for jogging/walking than the serious runners. For a treadmill desk workstation, however, you aren’t going to be doing serious running as you do need to be steady enough to control your mouse or do some typing. The great thing about converting your home office into a treadmill desk workstation is that you are able to create a healthier lifestyle. A treadmill desk keeps you moving. That ensures that key nutrients are able to flow through your body. It ensures that your muscles aren’t wasting away. Not only that, but movement helps to increase oxygenation to your brain. You will notice an increase in your ability to focus as you work on a treadmill desk. The confidence treadmill desk workstation that I created is very functional, but it does have a few downsides to it. First and foremost, the treadmill is set to only run for about thirty minutes before it stops and you need to reset it. This has some distinct advantages to it. It allows you to take a break and mentally keep track of how long you have been working. It requires that you give your eyes a break from the computer or work that you are on, bend over and stretch in order to the time and speed for your next thirty minutes. The downside to this feature is that it takes away from your focus a bit. Since I used an old drafting table and raised it with bricks and a board, there are times when my cheap treadmill desk workstation shakes a bit. It is resting on the console, and I have to bend over to turn the treadmill desk on. This is not a huge inconvenience and I’m willing to do it in order to get some walking done while I work! My personal experience with the confidence treadmill desk workstation that I created has been wonderful. It is much easier to get exercising in when I can turn on a movie to watch while I walk. Boring tasks like cold calling are turned into workout sessions as I utilize the time between calls to pick up the pace and move my legs. This prevents me from falling asleep or getting too frustrated at being rejected. This is not the best looking treadmill desk workstation. It is very ugly. For a sleeker look, you may want to select an under desk treadmill.